Pure, clean air is a basic necessity anywhere we live or work. But that was not always possible until now. We have assembled the most advanced air purifiers yet developed with our most advanced ionic ashtray to eliminate cigar and cigarette smoke, odor, dust, mold, allergens, pet odors and even help reduce mold, mildew, allergy symptoms more than any other indoor air purifier on the market. Our air purifiers are Ionic and use UV light to break down pollutants, these air purifiers have clinically been proven to remove cigar and cigarette smoke, create a zone of clean and pure air in offices, homes, agencies of our Federal Government, farms, factories, hotels, Bingo halls, restaurants, bars, cafeterias. kitchens, restrooms, break rooms, or where smoke and pollutants are a problem. These Bundles are for those who want the feel of a smoke free environment while smoking. Ideal for spaces up to 500 sq. ft. and using Capture Ionic Smokeless Ashtray, an advanced smoke removal system, with a Biozone PR05 an air purifying device that produces dramatic improvement in indoor air quality for your home. Both units are nearly silent and come with AC wall transformers ready to start. "Clean Room© Bundle I" is specifically put together to remove smoke from your environment. Our top of the line Capture Ionic Smokeless Ashtray Package SK008+ removes smoke from cigarette while in the ashtray and the Biozone PR05 air purifier removes exhaled and ambient smoke. Your air is kept clean and refreshed. Customers comment that their air feels lighter and smells fresher. Great for people with breathing problems or for areas with smoke and air contaminants. Ideal for spaces from 500-1000 sq. ft. This is an advanced smoke removal system, with a Capture Ionic Smokeless Ashtray and a Biozone PR10 an air purifier that produces dramatic improvement in indoor air quality for your home. Both units are nearly silent and come with A/C wall transformers ready to start. This "Clean Room© Bundle II" is specifically put together to remove smoke from your environment. Our top of the line Capture Ionic Smokeless Ashtray Package SK008+ removes smoke from cigarette while in the ashtray and the Biozone PR10 air purifier removes exhaled and ambient smoke. Your air is kept clean and refreshed. Customers comment that their air feels lighter and smells fresher. Great for people with breathing problems or for large areas with heavy smoke and air contaminants. Ideal for spaces from 1000-2000 sq. ft. This advanced smoke removal system, a combination of a Capture Ionic Smokeless Ashtray and a Biozone PR20, the top of the line ionic air purifier produces dramatic improvement in indoor air quality for your home or office. Both units are nearly silent and come with A/C wall transformers ready to start. 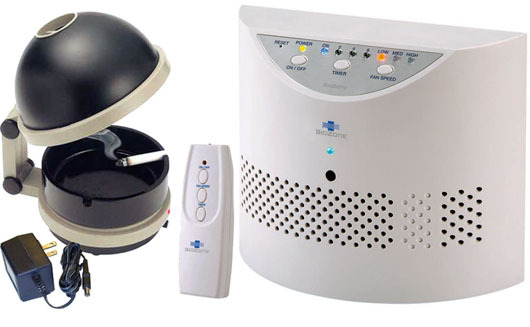 This "Clean Room� Bundle III" is specifically packaged to remove smoke from your environment. Our top of the line Capture Ionic Smokeless Ashtray Package SK008+ removes smoke from cigarette while in the ashtray and the Biozone PR20 air purifier removes exhaled and ambient smoke. Your air is continually kept clean and refreshed. Our customers comment that the air feels lighter and smells fresher. This Bundle is great for people with allergies or breathing problems or for larger areas with heavier smoke and air contaminants.